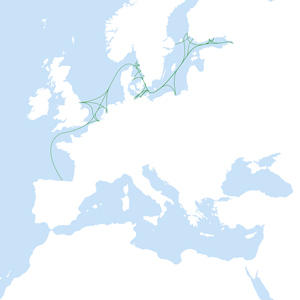 Finnlines’ Short Sea Shipping network in the Baltic Sea is a powerful tool in the northern region of Europe. Directly or through its subsidiaries, the company also offers regular Ro/Ro liner services between Finland and Germany, Scandinavia, Great Britain, Poland, Belgium and Spain thanks to a modern fleet of Ro/Ro-Passenger and pure Ro/Ro vessels. Special attention is paid to the development of the Russian market, where Finnlines operates its TransRussiaExpress, a direct weekly service running between Lübeck-Travemünde (Germany) and St. Petersburg (Russia). Finnlines has recently substantially enhanced the quality of service on its route connecting Lübeck-Travemünde, Helsinki and Poland by means of a 500 million euro investment on five Ro/Ro-Passenger ships able to carry up to 4,200 lane metres of cargo at a speed of 25 knots. The new vessels contribute to improving the Baltic Sea environment by using cutting-edge marine technology and carrying approximately 30% more cargo than their predecessors, while consuming the same energy. Such increased transport capacity is in line with the EU’s policy to transfer freight from the congested road network to the sea. Following this strategic path, the company has recently placed orders to build six more state-of-the-art Ro/Ro ships slated for delivery by 2012.